Having just returned home from an early evening walk…that magical time when light is fading, birds outlined in the sky heading for their evening resting places, and the sounds of insects everywhere. 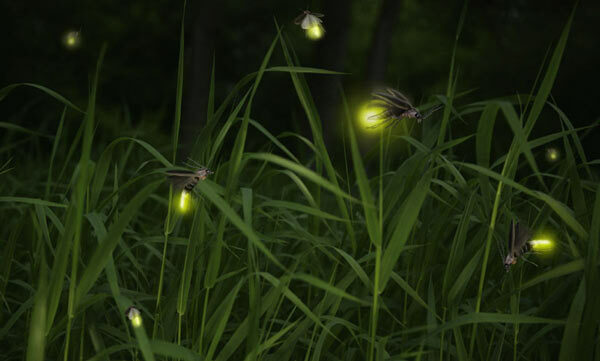 A few years ago I spent some time in Vermont and remember with great delight the first time – YES, the very first time – that I saw a firefly. Seems that they don’t have those magical creatures in California where I lived for most of my life. It was with absolute awe and delight that I watched these insects of light create a sort of fairyland in the surrounding fields and gardens. I remember feeling like a small child who was somehow transported to a magical land where the path was lit by very small creatures especially for me. Tonight, in the periphery of my vision, I caught a flash of light. I could hardly believe that it might have been a firefly for this is my 3rd summer in Austin and I don’t remember seeing any the previous 2 summers. But true to their magical character they proved to me that indeed they were out this evening as I spotted flashes of light along the path I was walking. I watched my breath deepen and open and realized that it was not just the fireflies that were magical. It was my inhale and exhale that stopped me in my tracks. Some huge number leapt out at me from my brains store of facts taken from the many workshops on breathing that I have done over the years. The average respiration rate for a person at rest is about 16 breaths per minute. If a person lives to 80, then that means on average they will take 672,768,000 breaths in a lifetime! For each breath we take there is potential. Like the fireflies that I did not notice the two summers prior to this one, many breaths have passed in my lifetime without gratitude for this magical process that gives us life. Although science can answer our questions about why the firefly lights up at the end of its body, and how our breath physiologically occurs – what cannot be answered completely is the source and creation of light and breath. May we always remember that there is mystery and magic to life. Each breath treasured and celebrated!